In the Fast Lane is a story for those of us trying – sometimes failing – to keep all the juggling balls in the air! A complex web of family relationships and life challenges is vividly weaved by Octogenarian author Lotte Moore, who exposes both the craziness and triviality of life 'in the fast lane'. Marriage breakdowns and corruption, catastrophe and chaos, romance and relationships, this is an emotional, moving portrait of the ups and downs of family life, and poses the question – can we ever be truly happy living in the fast lane? In The Fast Lane, written by prolific 82-year-old author Lotte Moore, is also a poignant portrait of the surprising benefits of suddenly being needed again in old age. Lotte Moore is the best-selling author of Lotte’s War, which reached number one in the charts after its release on Remembrance Day 2016. 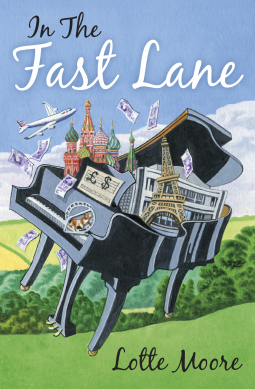 Perhaps best known for her children's books, Lotte is looking forward to publishing her first novel, In The Fast Lane. Lotte has written more than 25 published books yet only started writing aged 70. Now aged 82, Lotte has written a story that will resonate with every person who has struggled with juggling family life, parental responsibilities, work and career, children and a social life in today's fast-paced world. Lotte dedicates her time, freely, every week, to read her stories to children in pre-schools and primary schools, and she’s always particularly busy around World Book Day (1st March). Having grown up during World War Two, she has seen and experienced a lot in her life and continues to build contemporary fictional characters and worlds that reflect what is happening right now in society...As a child, Lotte lived in Kent with her parents who enjoyed entertaining, political debate and literary discussion with the likes of Charlie Chaplin, Winston Churchill, H E Bates, W H Auden and Benjamin Britten. In her early teens, her commitment turned to ballet, point shoes replaced the pen. She was selected by the Royal Ballet School to dance in the Opera Ballet. When rejected for growing ‘too tall’ Lotte turned to acting and intermittently to writing. She finally married aged 38 to her loyal husband Chris (who continues to support Lotte by typing out her hand-written stories). Lotte became immersed in her stepchildren and then her own two girls. When her daughters left home she describes “empty years” filled by illness and family problems, and she turned to writing once again. Lotte lives with her husband in Chiswick, West London. Launch event where the book is primarily set - Kensington - in June 2018. Blog tour scheduled for August 2018 - to join in with this fun event please get in touch and we'll send you pics, interviews, Q&As, articles and of course copies of the paperback for review and competition! Publicity campaign including broadcast, online and print.